The new HTML standard includes useful functions such as video playback and drag-and-drop which have been formerly dependent on third-party web browser plug-ins, like Adobe Flash Player and Microsoft Silverlight. With the new HTML5 tech designers is able to add some really awesome effects to their HTML5 video websites with ease. In this HTML5 beginners’ guide, we will show you how to build HTML5 video websites with HTML 5 Video Player in easy steps, no coding knowledge required! HTML5 comes with cleaner markups, the multimedia element < video > and < audio > are just some of many new tags and elements in HTML 5. The complexity of HTML5 arises not from the syntax, but from browser support and video encoding. So how do you encode a video on a HTML5 Website page? Right now you have three possible options for encoding your video to HTML5 video. You can read more on HTML5 Video Formats and Codec here. Do I have to make three different copies of the same video for HTML5 video websites? Yes. That’s true. As we have mentioned above the complexity of HTML5 video arises from video encoding and browser support. 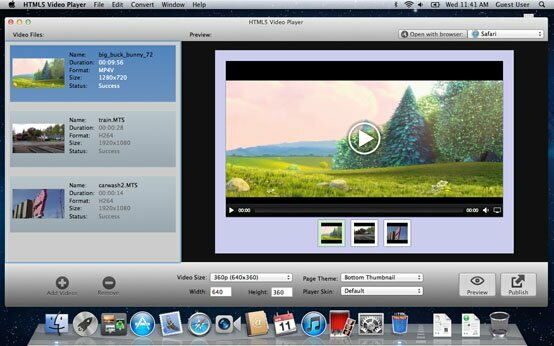 Here will recommend a professional HTML5 video website tool, HTML 5 video player. It can encode your video into three HTML5 video formats supported by all latest web browsers at the same time. How to Create HTML5 website videos? You can simply drag and drop your source videos to the HTML5 video website player. Or you can go to the Edit menu >> Add Videos to browse through your video albums on your computer and select to add them to the HTML5 video software. Once you are ready with tuning the HTML5 website video player, click the Publish button to generate your website HTML 5 video player. It will be saved in the Output Folder of the video tool on your hard disk. Go to the HTML5 menu, then choose Open Output Folder from the drop-down menu list. Now you are ready to publish your HTML5 video to your website.